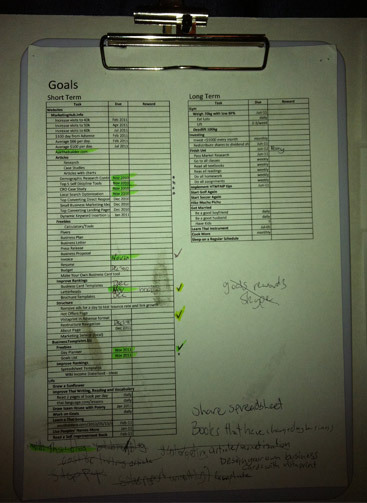 Following is a free Goals List Template which you can print, fill in your short term goals and long term goals and tick them once completed. You can put life/personal goals, professional/career goals and any others you can think of. 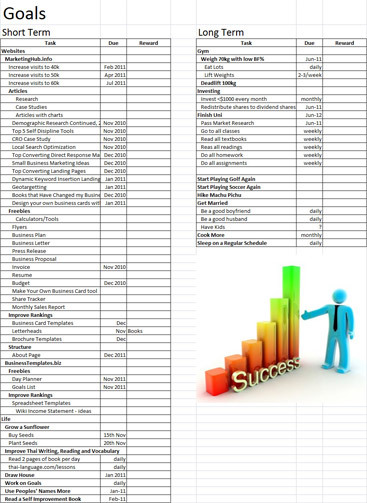 The Goals List Template is provided in .xls (Microsoft Excel) format. Having your goals written down, and breaking them into smaller steps will make you far more likely to achieve those goals. If it’s simply an idea floating in your head, you may not achieve it, so write them down. Download the template now and get started achieving your goals. Think of your short term and long term goals and categorize them into life goals, professional goals etc. Break down the goals into manageable tasks that you can complete each day to work towards the goal. Assign rewards to some of the tasks/goals. If the tasks look difficult, break them down further. Each day you should take some tasks from your goals list template and write them onto your Day Planner Template then complete the tasks and have your assigned reward.